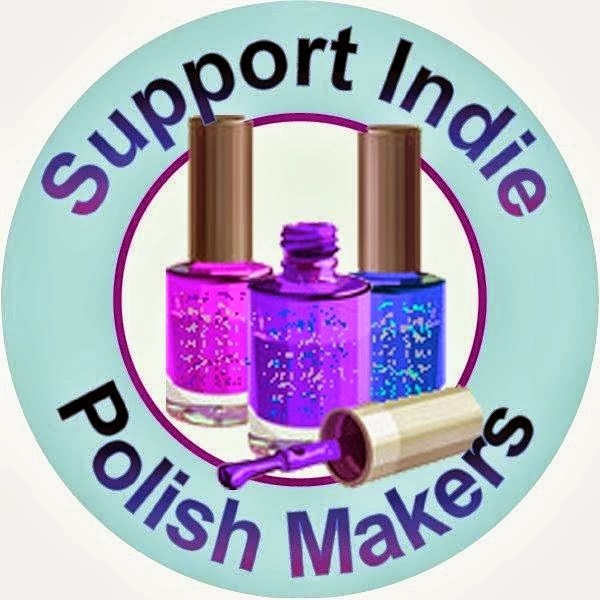 Recently, Llarowe marked all polishes in the sales category to half off for one day. 9 polishes worth $110 for $44! Do you like my new talons? My nails are super wide and they curl in so I thought this shape might work better for me. Burrrberry is described as a white crelly w/ an assortment of berry hex glitter. I used two coats. It would have totally covered w/ 3 coats but I didn't want more glitter. I'm a less is more glitter person. I used Glitter Daze's base coat and hk girl top coat. No undies. I'm not ready to give up yet. Next time, I will use a white undie - that may help. My latest haul from my awesome nail buddy. The sun decided to come out so here's some better pics. I love Indigo Bananas so I was elated to get Eris. It's described as a dusty lavender pink duo-chrome w/ a scattered holo that shifts purple and orange. Gorgeous! Pahlish is another favorite of mine and this polish is freakin' awesome. It's described as a deep violet jelly w/ violet glass flacks and color shifting orange iridescent glitter. A pretty red holo. It's described as a semi sheer red linear holo. It's more of a orange red but it's still pretty. She also sent me decants of Aly's Dream Polish in Tiffanytea, Dueling Unicorns from Different Dimension, Pahlish Mystery and Literary Lacquer in Pan Galactic Gargle Blaster. Do you have a nail buddy? I actually bought these 2 grab bags a few months ago - I'm behind! One thing that sets this apart from other grab bags - you can request brands and colors. I asked for no pink, my ten friends, polish w/ a white base and purple. Above the Curve - What No Buy?!?! This polish is sooooo beautiful. It's Fiery the Angels Fell from Indigo Bananas. It's a color shifting polish w/ glass flecks. It shifts from coral to red to orange and has a foil like finish. It looks better w/o a top coat but I have top coat on (hk girl). Top coat dulls the glass flakes IMO. No undies. 2 coats. Honestly, I HAVE to wear top coat. I don't have the patience to wait for my nails to dry w/o fast drying top coat. Indigo Bananas can do no wrong in my book. Every single polish is amazing. Fiery the Angels Fell is my favorite so far. Minis range from $6.25 - $7.25 I know that's spendy for a mini but her minis are 8ml. I received the most beautiful color this month - I'm in love! Lilac Luxe - A beautiful greyish lavender w/ silver & copper glitter. It also has iridescent glitter which makes it look like it's glowing. Sugar & Spice Mini - Orange & Brown Microglitter. Not a fan of brown but this color is pretty. It reminds me of glowing embers. I wanted to capture the glowing glitter in Lilac Luxe but the sun said no. Glitter Guilty Pleasures Box includes a full size monthly me polish - a custom made nail polish according to your likes. You also receive a monthly mini and a guilty pleasure - usually. All for $15.99 a month. Sign up here I would be ever so grateful if you could mention Angela Scooler in the referred by section. This is what it looks like when it's cold. This polish is so much fun! I get constant hot flashes from all the meds I have to take - this is me just sitting here. It keeps changing colors from orange to yellow. Application was a bit thick but no biggie. No undies. My 3rd round of mystery polishes from Pahlish. Every single one is gorgeous - damn it! I got 3 purple polishes (glitter, shimmer & holo) a blue glitter & a green holo. This smells delish. I'm not sure what scent it is but it smells fruity and the bar is huge. How cute are these little octopus soaps?! My most favorite thing in the box - mustache nail glitter! I love mustaches - I have all kinds of mustache stuff but I've never seen nail glitter. This girl is after my heart! I want to order another one!